This was an awesome post. Thanks so much for the information. I keep some dehydrated starter just in case I lose my fresh one. You can dehydrate some starter in the dehydrator or the oven. Fantastic tip Carole! How many days does it take you to refresh your starter and have it ready for bread? I have a gorgeous starter that is a few months old…I’ve never discarded any starter before feedings… I’ve never discarded any starter…. Is that bad?? Hi Sandi! If you haven’t discarded any starter before feedings, then you’re starter would be the size of a skyscraper! Do you actually use part of the starter to bake with it everytime you feed it, because that would be the same thing? Also, it’s important to discard or use a portion of the unfed starter before a feeding because it helps to balance the ph. Ideally, you want a smaller ratio of starter to water and flour so that there is less starter ‘fighting’ for food. Hi I’ve never discarded starter before. I have ten children and so when I bake bread I really bake bread! Could I just feed the starter more flour and water everyday and not throw any out? I usually make bread once a week… thanks! Yes, I would imagine you bake a lot of bread for your family! If you don’t want to discard any starter, then you would have to start with a giant vessel and have a small amount of starter at the beginning of the week after you bake a lot of bread. Actually, discarding some of the starter is good for balancing the ph of the sourdough. I completely understand not wanting to discard any starter because it can be wasteful if you don’t bake everyday with it. If you want to save yourself some time (and flour), don’t worry about feeding it everyday. Rather, keep it in the fridge, then take it out two days before you bake and give it two good feedings. On the last feeding before your large bake, increase the amount of water and flour to ensure you have enough for all of your loaves. This way, you would only discard some of the starter from one feeding. Ideally, you want to have a small amount of unfed starter in proportion to new flour and water so that the starter isn’t “fighting” to get food. If you have a large amount of unfed starter, you would need to have an enormous amount of flour and water to feed with it so that it doesn’t eat through the mix in a small amount of time. So in essence, if you don’t discard any starter (and you don’t bake everyday) you might actually be wasting even more flour that way to keep your starter balanced with a good ph. You can try out the fridge method since you bake every week. You’ll just need to set a reminder either on your phone or in a way that you will remember to take out the starter two days before so you can feed it. If you bake on a Saturday morning, take it out on Thursday morning to feed. You will definitely need to stir the starter and discard a portion before this feeding since it’s been in the fridge and it will be more acetic. Also remember, you don’t need to have a large portion of starter to be reserved in order to keep it going. As long as you have about 1/4-1/2 cup or so reserved in the fridge, your starter will be fine. You could even get away with as little as 0.1% (living starter) of the total amount during a feeding in order to keep the starter going. Hope this helps, and let me know if this works for you. I know your time is precious with lots of little ones to care for! How can I make my bread more sour.? If you like robust sour flavor then you can add more sourdough culture to your dough. Keep in mind this will affect the fermentation time of your bread, as it will ferment faster. However, a sourdough culture is very forgiving to fermentation as it ferments much more slowly than dry yeast. My Honey Sourdough Spelt Bread is pleasingly sour, so if you would like to try that recipe, I’ll think you’ll love it! Also, a rye sourdough culture (one that is fed only water and rye flour) lends a more assertive sour flavor than sourdough starters fed water and white flour. San Francisco sourdough bread is known for having a nice sour flavor. They add quite a bit of sourdough starter to their loaves and ferment for long periods of time which develops more flavor. Even though the San Francisco sourdough culture contains different bacteria only found in that region (giving it a unique flavor), you can still replicate the process at home with your culture. Thank you so much for very useful information about sourdough starter. I have a rye starter for some months and I didn’t discard any of that but recently I have noticed that a layer of brown water stands on the surface of it. Is it okay? Can you suggest a rye bread recipe with sourdough? Hi Sori! When you say you haven’t discarded any of the starter over the course of a few months, do you mean that you use some of the starter every day for a bake? Either using some of the starter before a feeding or throwing some of it away is the same thing. If you haven’t thrown out any starter or used it in baking before each feeding, your starter would be massive and would need an enormous amount of flour and water to feed it. As far as the liquid on top, that’s called the “hooch”. It just means that you may be waiting too long in between feedings and your starter needs to be fed more frequently. Ideally, you need to feed your starter no more than 24 hours apart to ensure it’s fed enough. I know how difficult it can be to feed it at the same time every day because life happens and you get busy, so my starter will sometimes have some hooch at the top. If you are feeding it within a 24-hour window and you are still getting some hooch at the top, then your water or your kitchen might be too warm. So you can just use slightly cooler water or place in a cooler spot in your kitchen. If it’s warm where you place your starter, it will ferment faster, hence it needs to be fed more often (say every 16-20 hours). When you are doing your feedings, I suggest starting with 20 grams starter, then 50 grams water and 50 grams flour to have enough starter to keep it going. If you know you want to make a recipe that needs 100 grams of starter or more, then on the last feeding before you mix the dough, you will need to increase the amount of starter, water, and flour so you have enough for the recipe and at least 20 grams left for the next feeding. Does that make sense? When you feed your starter, just because it rises, that doesn’t mean that it increases the amount that you have. If you fed your starter 20 grams starter, 50 grams of water and flour, then your measurement when it’s ripe will still equal the same, 120 grams. So if your recipe calls for 200 grams, then you’ll need to make sure you have at least 220 grams of culture in total after a feeding (200 grams for the recipe, and 20 grams for the next feeding. If you are keeping it in the fridge, when you take it out to feed it, it will need 2-3 feedings before it’s ripe and ready to use in a recipe. So your first feeding out of the fridge can have 20 grams starter, and 50 grams of water, 50 grams flour. Then the next feeding (about 8-12 hours later) do the same amount, then on the third feeding, you can increase the amount to the amount you need in a recipe, plus 20 grams extra for the next feeding. This is why I hate using recipes that don’t give measurements in grams. A recipe that says “1/2 cup starter” doesn’t tell you how much a 1/2 cup weighs, so you are having to guess at how much you’ll need for the feeding before. This is probably one of the reasons why you don’t have enough starter for your recipe because you’re likely having to guess at your measurements. I would recommend only using recipes that have the measurements in grams or ounces to avoid confusion. All of my bread and pastry recipes use American measurements, plus the weight in grams. King Arthur Flour has thousands of recipes in grams and ounces, so they are an awesome resource as well. I know all of this can be a bit confusing, so please don’t hesitate to ask more questions if I need to clarify anything. I want to make sure you are successful when baking, so I’m happy to help!! Hey there, I have a mother dough that I started 5 months ago and love making bread. I found your blog very interesting to read, especially about physical acid and the bacteria cultures in sour dough that break down gluten. I was just curious about where you know this information from? With the Internet being filled with garbage, I am always interested in finding where people get their info. I don’t mean for this to call into question your integrity, but I simply want to make sure it’s good information 🙂 Thank you! Hello Aiden, this is actually a really important question! We should all look at information more objectively and take everything (especially on the internet) with a grain of salt. Actually I learned all of this information when I went to artisan bread school in Chicago for two months from my instructors at the French Pastry School who all had decades of experience as artisan bread bakers. One of my instructors was Chef Jeffrey Hammelman who is the head baker at King Arthur Flour Bakery in Vermont and he talked extensively about the power of a sourdough starter, including the issues with phytic acid and how a sourdough starter can help your body absorb nutrients you wouldn’t be able to without it. The great thing is there is actually a lot of science behind baking bread that has been studied extensively throughout history. 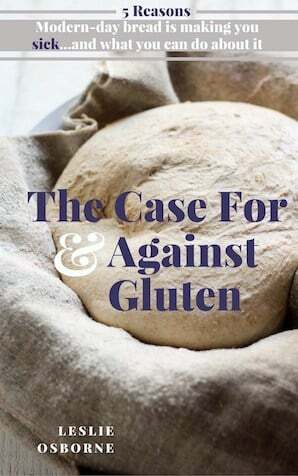 Often this kind of information isn’t well-known because you have to understand the science behind baking bread and how gluten forms, plus how fermentation affects the nutritional value of bread. A lot of what I learned in culinary school about bread specifically was how it has changed dramatically since the invention of commercial yeast. In France, the art of baking bread the slow way with a sourdough culture has been preserved unlike here in the U.S. So it was very enlightening learning about the problems with modern-day bread by understanding how it’s changed throughout the last several decades especially.